A new report on the state of bicycling in Silicon Valley takes a unique regional view on what biking can do for cities, and especially the cities of the San Francisco peninsula. Those places are not exactly famous for being great for bicyclists, and they share characteristics that make biking seem unsafe, such as wide, fast roads and hard-to-cross highways. But there are patches of the Silicon Valley that can be safe and inviting, such as Stanford. The chart above shows the stark differences between the Stanford campus, which has extensive separated bicycle and pedestrian pathways, and the city of San Jose that, despite recent efforts, has few safe bike facilities. Stanford, with a high number of bicyclists on its campus, has few crashes or injuries. What does Stanford have that other Silicon Valley cities lack? Getting cities to ask that question was one of the purposes of creating the Silicon Valley Bike Vision, in which those charts appear. A chance meeting between Russell Hancock, CEO of Joint Ventures Silicon Valley, and Shiloh Ballard, executive director of the Silicon Valley Bicycle Coalition, planted a seed that eventually led to the creation of the bike vision report. Joint Ventures and the Bike Coalition approached Google, which had already produced its own, very local Google Bike Vision Plan, and Facebook, which has a campus in the area as well, and secured funding to collect data. Stanford also contributed funding, and Nelson\Nygaard contributed to the report. The resulting document shows what Silicon Valley cities are doing right, as well as what they could do better to improve conditions for bicyclists and encourage more people to ride. It serves as a vision of what bicycling could be like in the Silicon Valley, and provides a general roadmap on how to get there. The report, as highlighted by Rachel Dovey in Next City, takes a regional look at what is usually only planned for locally. In doing so, it made an interesting discovery: that many of the most dangerous intersections for bicyclists are at the borders of the cities. Why is that? Is it a communication problem between cities? The report suggests some solutions, like taking part in the relatively new Managers Mobility Partnership, a regional, cross-jurisdictional planning forum that brings together local city managers to discuss overlapping issues. “Regional planning can be difficult because regional planners can’t decide for locals how they spend their money,” said Drusilla van Hengel, one of the planners at Nelson\Nygaard that worked on the document. But through the efforts of groups like Joint Ventures and the Managers Mobility Partnership, it’s not impossible. Four of the peninsula cities–Redwood City, Palo Alto, Menlo Park and Mountain View—just launched a joint planning effort to develop a regional bike corridor. The Bike Vision report also details how the cities differ and why they have different levels of bicycling. For example: does a city have a robust, engaged, passionate Bicycle Pedestrian Advisory Commission? Does it have city staff dedicated to these issues? Does it have an updated Bike Plan, and has it adopted a Vision Zero plan or the NACTO street design guidelines? One of the other accomplishments of this document is that it sets a high standard. It’s not a government-adopted plan, with the power to enforce actions, but it does provide a broad vision of what is possible, and it provides a tool for advocates who can take it to cities and agencies and use it to help inform the public. “These groups aren’t content to just support or even privately fund good bicycle infrastructure. They’re actively trying to create a new minimum baseline of what is considered acceptable for planning and bike facilities in the South Bay,’ he added. Be sure to take a look at the section on the benefits of bicycling. This is the kind of data presentation–clear messages and simple graphics on health, safety, perceived comfort, and economic benefits—that will be useful to a broad swath of advocates, government officials, agencies, planners, and anyone else wanting to know about bike infrastructure or encourage more bicycling in American cities. The one thing that differentiates the Stanford campus the most is that they charge a lot for workers to park a private automobile all day. This leads to a much higher use of biking and transit than nearby commercial areas. A second factor is that Stanford has build substantial numbers of houses and apartments for its workers, so those who live on campus have an easy bike ride or walk to their work. 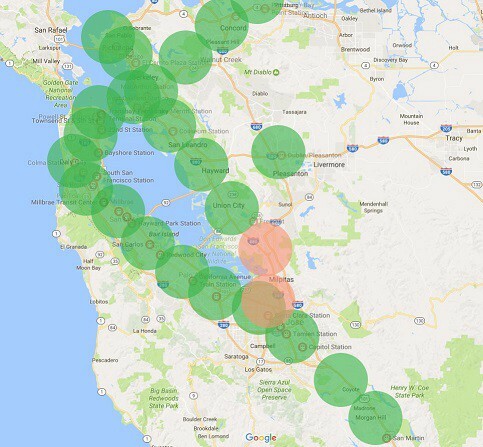 here is map of bart and caltrain stops with a 5 mile radius.